Decorated denim is a thing! We're talking the trend you've got to try, and Diane has you covered with embroidered skinny jeans made from comfortable, cotton-rich virtual stretch denim. Replicate the steal-worthy looks today's influencers are wearing with great-fitting embellished jeans. They're your ticket to head-turning street style. 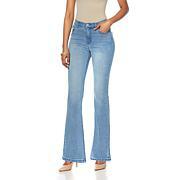 I am proud to wear all Diane' s jeans. This edition is just enough to say "I am still sassy, but refined".I need more bell bottom embroidered jeans, Ms. Diane! 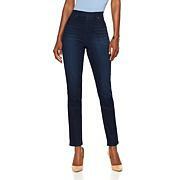 This was my first purchase of any jeans thru HSN. They said to order one size down from your regular size. Not having a "regular" size I went by the size chart listed for this product and as I was between a 12 and a 14 on the measurements I ordered a 12. It was too big so I exchanged for a 10 (I ordered tall both times). The fit was ok, but if I order again I will order an 8 as the 10 was still a little large. I love the comfort of these jeans. So many compliments! Such a pretty design. So comfortable.Thank you so much for the Tall sizes! 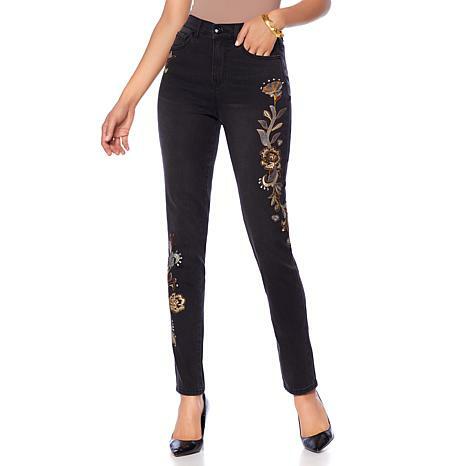 The virtual stretch jeans have indigo and silver floral designs down the legs. Really pretty and great with silver jewelry. The fit is great. Love DG2. I just love these jeans. The design is fabulous and the fit is great. The embroidery is so well done and the placement on the jeans is perfect. I love virtual stretch. I order them all the time.